Anaphylaxis can happen anywhere.1-5 Discover the features of AUVI-Q and ask your doctor if it’s the best fit for you. 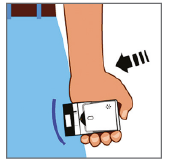 Seek emergency medical help immediately after use. If voice instructions do not work for any reason, AUVI-Q will still work during an allergic emergency. Always read the full Instructions for Use found in the Patient Information. do you prefer to read the instructions? 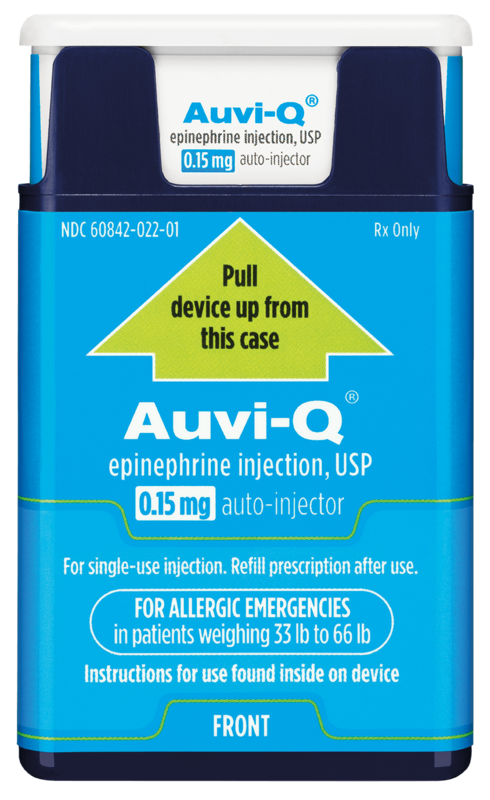 Infants and toddlers (weighing 16.5 lbs to 33 lbs) with life-threatening allergies may be prescribed AUVI-q ® (epinephrine injection, USP) 0.1 mg. Skip down to more information about AUVI-q 0.1 mg to watch a different administration video for the 0.1 mg strength. Who might have to administer auvi-q? What if someone with little or no training is asked to use AUVI-Q? as she explains what voice instructions of AUVI-Q mean to her. Head over to information about how you can have your Amazon Alexa voice assistant play the AUVI-Q recording on command. 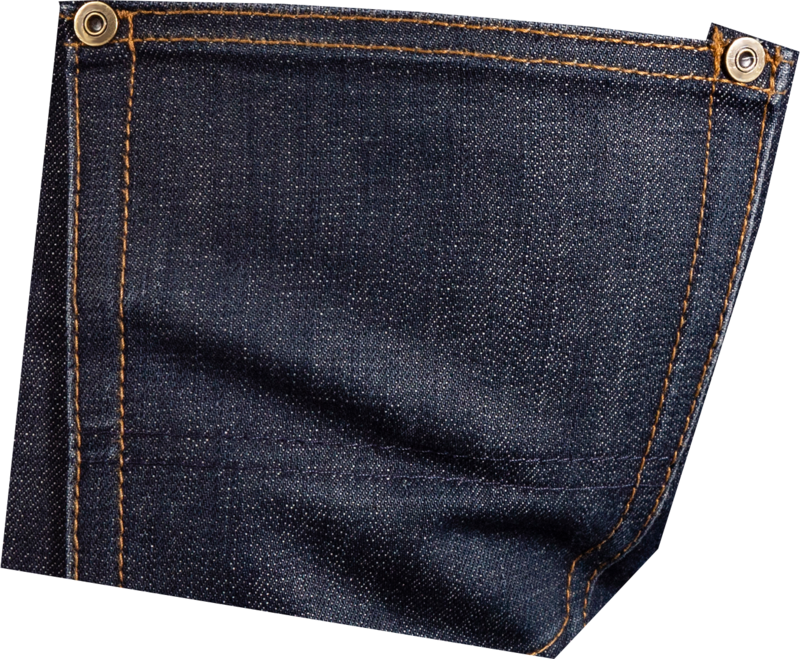 About the size of a credit card and thickness of a cell phone, AUVI-Q fits in most pockets. You can see a real-time simulation of AUVI-Q being used here, or a different simulation of the AUVI-q 0.1 mg strength here. Beyond an auto-retractable needle, the AUVI-q 0.1 mg needle has other features specifically designed for infants and toddlers weighing 16.5 lbs to 33 lbs with life-threatening allergies. Keep reading for more. Ask your doctor which of the 3 strengths available is right for you or your child. AUVI-q 0.1 mgFor infants and toddlers weighing 16.5 lbs to 33 lbs. AUVI-Q 0.15 mgFor children weighing 33 lbs to 66 lbs. 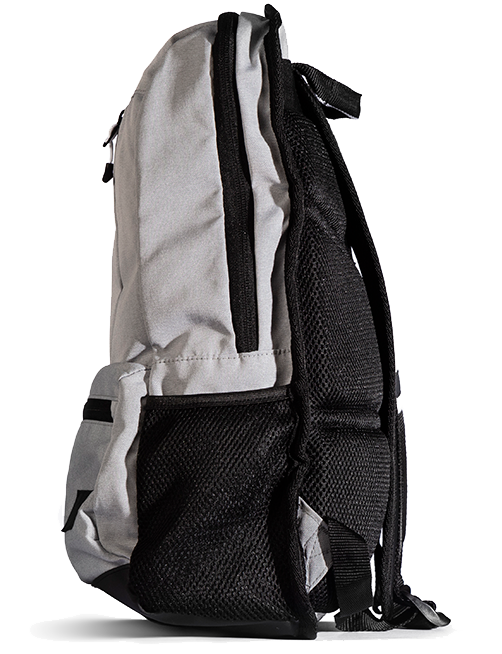 AUVI-Q 0.3 mgFor anyone who weighs 66 lbs or more. 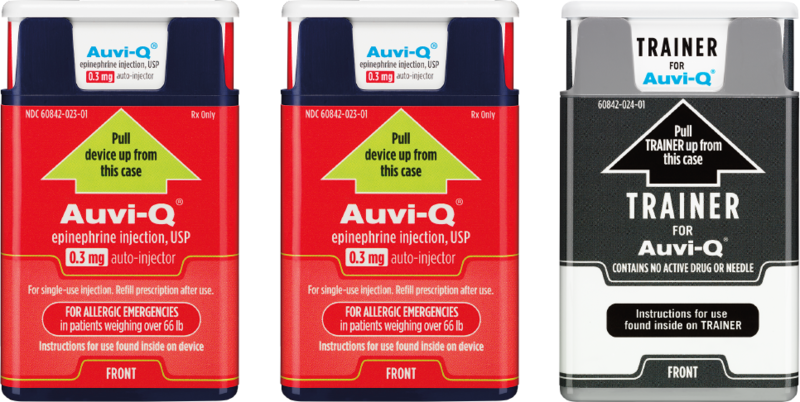 AUVI-q 0.1 mg is the first and only FDA-approved epinephrine auto-injector designed specifically for infants and toddlers weighing 16.5 lbs to 33 lbs. auto-injectors that helps deliver the dose at the right depth. 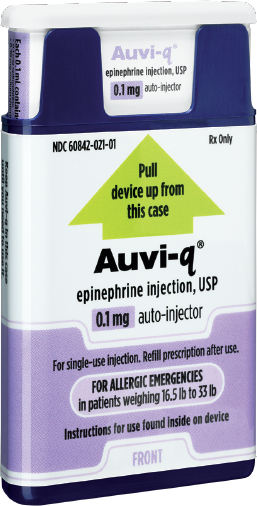 Each AUVI-q contains a single 0.1 mg epinephrine dose. AUVI-q 0.1 mg contains the same easy-to-use features as the rest of the product family. 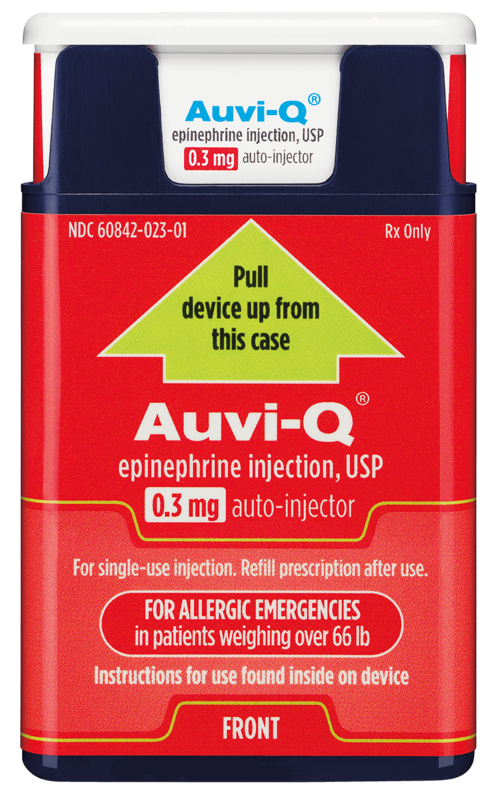 Take a look at a simulated injection with the AUVI-q 0.1 mg dose. 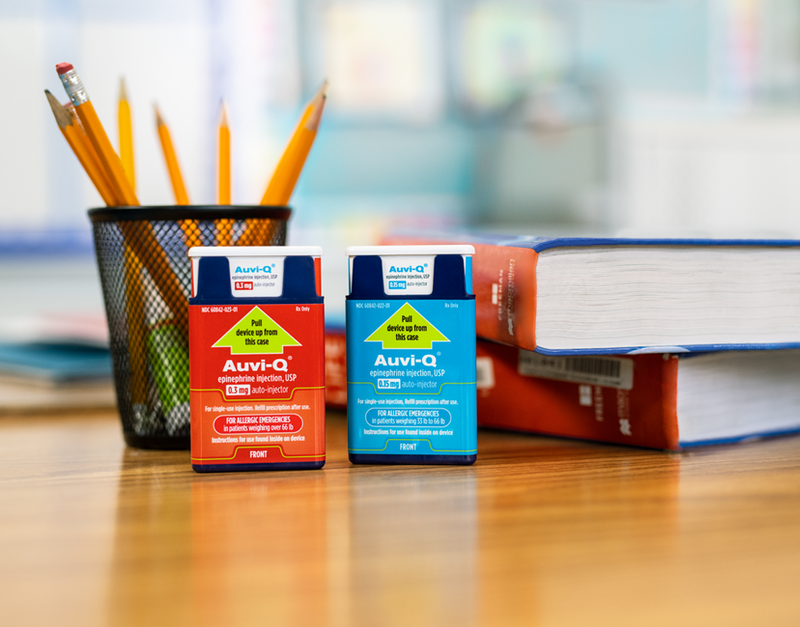 If you inject a young child or infant with AUVI-q, hold their leg firmly in place before and during the injection to prevent injuries.6 Ask your healthcare provider to show you how to properly hold the leg of a young child or infant during an injection. Compare this video with one showing how a teen or adult can self-administer their AUVI-Q to see how the features were designed to make all AUVI-Q devices easy to use. From our founders to our growing community, meet the people behind the brand. Our story starts with twin brothers who grew up with life-threatening allergies, became an engineer and a doctor, and invented AUVI-Q. Now, the AUVI-Q community spans the country. Ready to become a part of the AUVI-Q Community? Find out more about how to get AUVI-Q. Download your enrollment form, learn about financial support options, and find out how AUVI-Q can be delivered directly to your door. It’s simple. If you and your doctor determine AUVI-Q is right for you, you’ll be contacted to schedule the direct delivery of AUVI-Q so it can be shipped to you with the best product dating. Download the enrollment formFill out your information and bring to your physician to see if AUVI-Q is right for you. schedule delivery through the direct delivery serviceYou’ll be contacted to schedule the delivery of your prescription. We will work with you to schedule the delivery of your AUVI-Q. Have your insurance information on hand. Save 1-844-357-3968 to your contacts for refills or questions. Schedule your direct delivery of AUVI-Q by answering a call from 1-844-357-3968. That’s it! Your AUVI-Q will be shipped directly to your home. Each prescription pack will contain 2 auto-injectors and 1 trainer. The Trainer for AUVI-Q does not contain a needle or medicine and can be reused to practice an injection. It is important to practice with the Trainer for AUVI-Q before an allergic emergency happens to ensure you are able to safely use the real AUVI-Q in an emergency. Through the kaléo Cares Patient Assistance Program, patients who do not have commercial insurance and who are experiencing financial difficulties may be able to receive AUVI-Q at no cost. Have a prescription for AUVI-Q. Not have any government or commercial drug coverage. Have an annual household income of less than $100,000. *Patients who are eligible for Medicaid coverage may be eligible for assistance to receive AUVI-Q at no cost. Facts, tips, forms, and more. Select from a wide range of resources to get what you need. Get to the right resources fast. Choose the filters that best fit the information on life-threatening allergies (LTAs) that you are looking for. Please see the full Prescribing Information and the Patient Information. EpiPen® is a registered trademark of Mylan Inc. Intended for US audiences only. Tiyyagura GK, Arnold L, Cone DC, Langhan M. Pediatric anaphylaxis management in the prehospital setting. Author manuscript published by the National Institutes of Health, Public Access, PMC January 1, 2015;1-11. Published in final edited form in Prehosp Emerg Care. 2014;18(1):46-51. Radke TJ, Brown LG, Hoover ER, et al. Food allergy knowledge and attitudes of restaurant managers and staff: an EHS-NET study. Author manuscript published by the Department of Health and Human Services, Public Access, PMC February 23, 2017;1-24. Published in final edited form in J Food Prot. 2016;79(9):1588-1598. Wahl A, Stephens H, Ruffo M, Jones AL. The evaluation of a food allergy and epinephrine autoinjector training program for personnel who care for children in schools and community settings. J Sch Nurs. 2015;31(2):91-98. Robinson M, Greenhawt M, Stukus D. Factors associated with epinephrine administration for anaphylaxis in children before arrival to the emergency department. Ann Allergy Asthma Immunol. 2017;119:164-169. Bock SA, Muñoz-Furlong A, Sampson HA. Fatalities due to anaphylactic reactions to foods. J Allergy Clin Immunol. 2001;107(1):191-193. 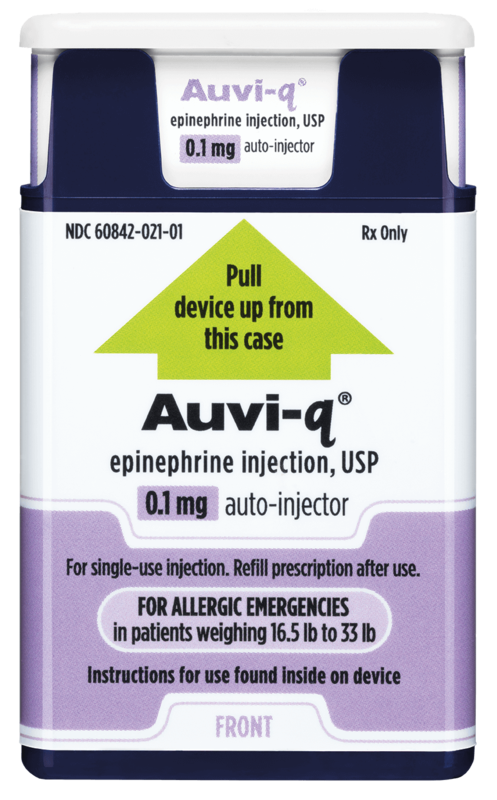 AUVI-Q [Prescribing Information]. Richmond, VA: kaleo Inc.; 2017. Allen K, Henselman K, Laird B, Quiñones A, Reutzel T. Potential life-threatening events in schools involving rescue inhalers, epinephrine autoinjectors, and glucagon delivery devices: reports from school nurses. J Sch Nurs. 2012;28(1):47-55. Young M, Muñoz-Furlong A, Sicherer S. Management of food allergies in schools: a perspective for allergists. J Allergy Clin Immunol. 2009;124(2):175-182. Edwards ES, Edwards ET, Gunn R, et al. 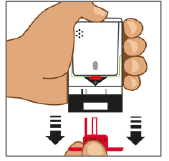 Design validation and labeling comprehension study for a new epinephrine autoinjector. Ann Allergy Asthma Immunol . 2013;110(3):189-193. Camargo CA Jr, Guana A, Wang S, Simmons FER. 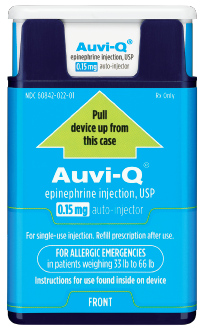 Auvi-Q versus EpiPen: preferences of adults, caregivers, and children. J Allergy Clin Immunol Pract. 2013;1(3):266-272.e1-e3. Only valid for commercially insured patients in the 50 United States and DC through the direct delivery service and/or designated retail pharmacies. Not eligible if prescriptions are paid for in part/full by state or federally funded program(s), like Medicare Part D, Medicaid, Vet. Aff., Dept. of Def., or Tricare, and where prohibited by law. OFFER IS NOT INSURANCE. Offer cannot be sold, purchased, traded, transferred, and cannot be combined with any other offer. Cash discount cards are not commercial payers and are not eligible to be used for this program. Offer provided by kaléo, and it may change at any time without notice. Call 1-877-30-AUVIQ for questions regarding offer eligibility. Please understand that AUVI-Q is not responsible for how your information is processed or used on non-AUVI-Q sites. Also note that providing links to non-AUVI-Q sites is not an endorsement of the other site by AUVI-Q or any of its employees. And finally, be aware that the privacy protection provided on our site may not be available on an external link. The health information contained herein is provided for general educational purposes only. Please consult with your healthcare professional if you have any questions about your health or treatment. For us, the patient always comes first. We believe the most important price is the price to the patient. We believe that patients with life-threatening conditions deserve fair access to the latest medicines that offer technological innovations that address their medical needs. We believe that when a healthcare practitioner prescribes AUVI-Q, patients should be able to fill their prescription without high out-of-pocket costs. We have seen firsthand in this current healthcare system the very real challenges patients are facing in being able to access and afford potentially lifesaving medicines. Similar to our product innovation process, our AUVI-Q patient access program has been built to solve for some of these challenges and help focus on what matters most... access and affordability to AUVI-Q for patients. Kaléo is committed to the highest standards of product and manufacturing quality. Final manufacturing and assembly of AUVI-Q is conducted in the United States on a 100% automated robotic production line with more than 100 automated quality checks on each and every product. Patients can be confident in our approach to design quality into AUVI-Q and incorporate quality into every aspect of the manufacturing process. Pull AUVI-Q up from the outer case. Do not go to step 2 until you are ready to use AUVI-Q. If you are not ready to use AUVI-Q, put it back in the outer case. Pull red safety guard down and off of AUVI-Q. 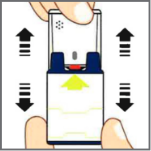 To reduce the chance of an accidental injection, do not touch the black base of the auto-injector, which is where the needle comes out. If an accidental injection happens, get medical help right away. 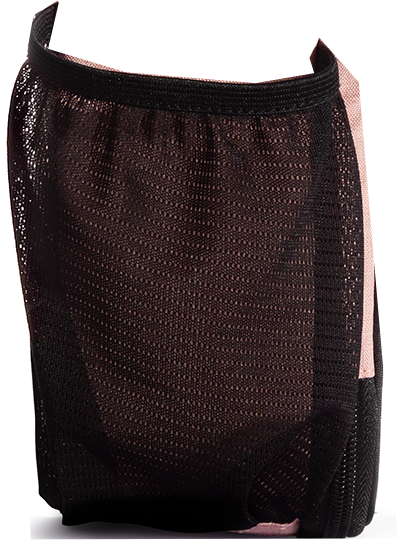 Note: The red safety guard is made to fit tightly. Pull firmly to remove. Place black end of AUVI-Q against the middle of the outer thigh, then push firmly until you hear a click and hiss sound, and hold in place for 2 seconds. 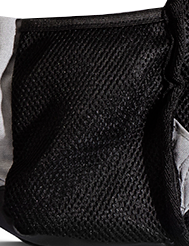 AUVI-Q can inject through clothing if necessary. ONLY inject into the middle of the outer thigh. To minimize the risk of injection-related injury, instruct caregiver to hold a young child’s or infant’s leg firmly in place when administering AUVI-Q. After use, instruct patient to get emergency help right away. To minimize the risk of injection-related injury, instruct caregiver to hold a young child’s or infant’s leg firmly in place when administering AUVI-Q. Kaléo, the maker of AUVI-Q, understands the importance of having emergency medications available to patients. We also recognize that some patients may have financial difficulties that prevent them from obtaining these needed medications. Through the kaléo Cares Patient Assistance Program, patients who are experiencing financial difficulties may be able to receive AUVI-Q at no cost. Patients who are eligible for Medicaid coverage may be eligible for assistance to receive AUVI-Q at no cost.